Over the last three decades, MBARI researchers have shown that it is often cheaper and safer to use robots instead of humans to conduct fieldwork in the ocean. 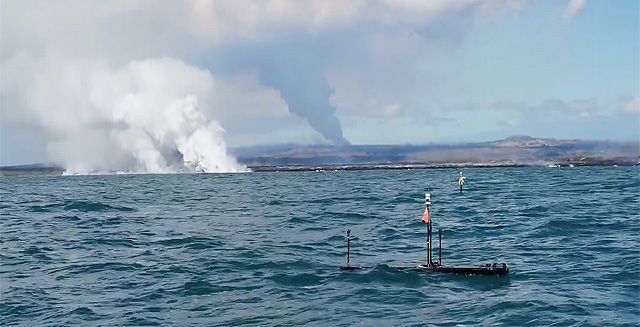 Safety was a particular concern for researchers in Hawai`i who recently studied a plume of hot water created by an active lava flow entering the sea. For this reason, they sent two surfboard-like surface robots to make measurements in the area. Software developed by MBARI engineers guided one of these robots and kept it out of harm’s way as it zigzagged around the edge of the plume. In May 2018, Kilauea volcano on the Big Island of Hawai‘i erupted, creating spectacular fire fountains and a massive river of lava, which has been flowing into the ocean near the eastern corner of the island. 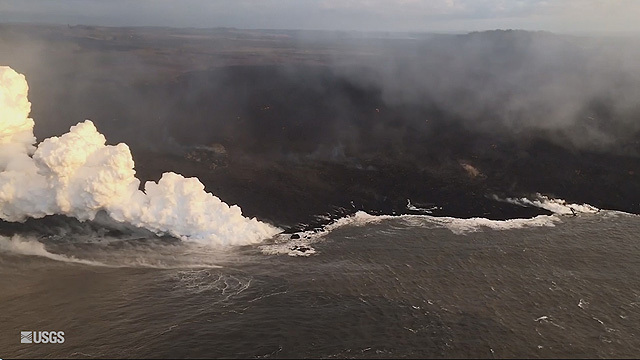 When this lava comes in contact with seawater, it explodes, sending fragments of volcanic rock and glass into the air and ocean. It also superheats and reacts chemically with seawater, releasing hydrochloric acid and other chemicals. 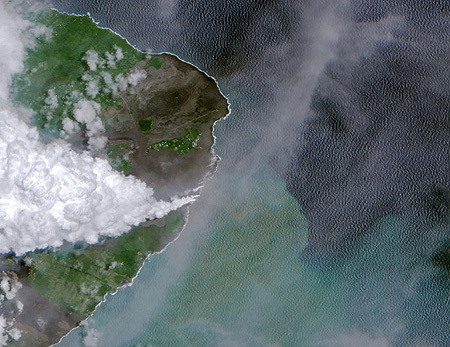 Using satellite images and aerial photos, scientists observed large plumes of discolored seawater streaming away from the area where lava is entering the ocean. But they couldn’t tell if the discoloration is caused by sediment, chemicals, or perhaps algae growing in the water. In any case, researchers saw this voluminous eruption as a rare opportunity to learn how volcanic eruptions could affect the chemistry and biology of the ocean. Needless to say, it can be very dangerous for humans to do fieldwork near large, active lava flows. In mid July chunks of lava from the flow were blasted into the air and out to sea, injuring almost two dozen people on a sightseeing boat that got too close to shore. Not only that, but the seawater itself can easily reach temperatures of 50 degrees centigrade (122 degrees Fahrenheit)—hot enough to burn human skin. In situations like this, it makes sense to let robots do the fieldwork rather than people. Fortunately, in this case, appropriate robots were already close at hand. The island of Hawai‘i hosts a research facility run by a company called Liquid Robotics (a subsidiary of Boeing), which develops and sells autonomous ocean-surface vehicles called Wave Gliders. Two Liquid Robotics Wave Gliders monitor ocean conditions offshore of an active lava flow on the island of Hawai`i. Image courtesy of Liquid Robotics. Resembling long, squared-off surfboards, Wave Gliders are in fact propelled across the surface by the motion of the ocean waves. This means that they can stay at sea for months and travel across entire ocean basins without draining their batteries. Wave Gliders also carry solar panels that can power scientific instruments and transmitters that send data from these instruments back to shore via satellite. When Wave Gliders first came on the market, MBARI engineers were some of the first to realize the potential of this platform for carrying scientific instruments that could remotely monitor ocean conditions and relay data back to shore. Over the last five years, MBARI has worked closely with Liquid Robotics to develop new instruments and research applications for Wave Gliders. In late June 2018, Liquid Robotics sent two Wave Gliders on a potentially perilous mission to monitor the ocean a few hundred meters offshore of the active lava flow on Hawai‘i. Working with researchers at the University of Hawai‘i at Hilo, the Massachusetts Institute of Technology, and the U.S. Geological Survey’s Hawaiian Volcano Observatory, they outfitted these Wave Gliders with cameras and instruments to measure the temperature, conductivity, oxygen concentration, pH (acidity), salinity, and turbidity of the surrounding seawater. Initially these Wave Gliders were programmed to follow a pre-set zigzag path at a certain distance from the shore. But the researchers were particularly interested in studying differences between water inside the hot-water plume and water outside the plume. This was difficult because the plume of heated water was constantly moving around. At that point, the Liquid Robotics engineers contacted their colleagues at MBARI. They knew that MBARI had already developed software that would allow a Wave Glider to autonomously follow and map the boundary (front) between two distinct water masses in the ocean. During MBARI’s annual CANON experiments, Wave Gliders run the software to track “upwelling fronts” that form where cold upwelled water from outside of Monterey Bay comes in contact with sun-warmed water inside the bay. MBARI engineer Yanwu Zhang, who led the development of the autonomous front-tracking methods, explained how the front-tracking software works on a Wave Glider: The Wave Glider feeds seawater-temperature data to the software in real time. The algorithm compares the current temperature to the temperature measured when the Wave Glider was 300 meters behind its current position. If the temperatures are similar, the Wave Glider continues on its course. However, if the difference between the current and older temperatures is great enough, the software determines that the Wave Glider has crossed the boundary between the plume and the surrounding water. In this case, the software tells the Wave Glider to continue on its path for another few minutes until it is well past the boundary zone. Then the vehicle makes a sharp turn to (presumably) head back across the boundary into or out of the plume. In this way, the Wave Glider zigzags tightly back and forth across the front, collecting data as it goes. These data include high-resolution information about water properties on both sides of the front, as well as information about the location of the front itself. 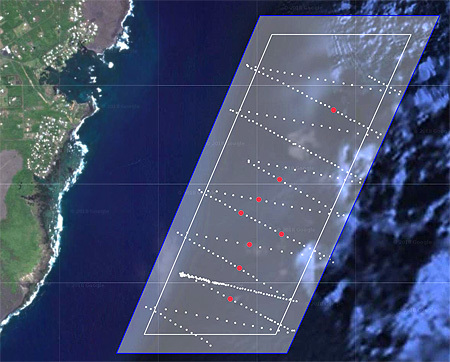 This image shows one pass of a Wave Glider along the coast of Hawai`i on June 24, 2018. White dots indicate the positions of the Wave Glider; red dots indicate where the Wave Glider detected a front. The pre-eruption coastline shown in the background includes Kapoho Bay (upper left), which was completely buried by lava during the eruption. Base image: Google Earth. During the Hawai‘i experiment, the software not only had to instruct the Wave Glider to follow the front, it also had to make sure that the vehicle didn’t get too close to shore or venture into water that was too hot. In either case, the Wave Glider would automatically turn around and head toward safer water. Zhang enjoyed the opportunity to apply his front-tracking method in lava-plume studies. “This was a once-in-a-lifetime event,” he said. “Two years ago we developed a front-tracking approach for Wave Gliders based on an algorithm we created previously for our autonomous underwater vehicles. I’m glad this effort is paying off. “We had a great team working on this project,” Zhang added. MBARI Engineer Brian Kieft and Oceanographer John Ryan helped develop the autonomous front-tracking methods. MBARI Software Engineer Carlos Rueda wrote a computer script that coded the tracking algorithm into commands the Wave Glider could understand. And Rueda, Zhang, and Software Engineer Tom O’Reilly worked closely with the Liquid Robotics engineers to monitor the vehicle’s behavior through the course of the experiment. Oct 3, 2016 - During a recent mission, MBARI's Wave Glider Tiny ran into some problems. When MBARI engineers went to sea to recover the Wave Glider, they discovered major damage to the fiberglass hull, mast, and solar panels. Mar 31, 2014 – As their name implies, autonomous underwater vehicles (AUVs) navigate through the ocean on their own. In situ sensors on the AUVs measure physical characteristics (such as temperature and salinity) that are useful for scientists. But how and when do MBARI scientists access these data from AUVs?